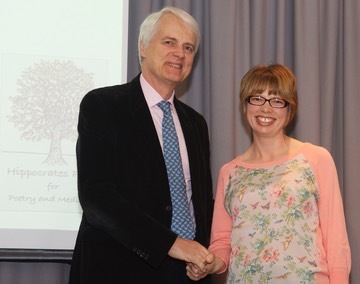 At an Awards Ceremony at the Royal Society of Medicine in London, the £5000 2014 Hippocrates NHS first prize has been awarded to trainee paediatrician Dr Ellen Storm for her new poem Out of Hospital Arrest. The second prize was won by Valerie Laws from Tyne and Wear for her poem Acute Mountain Sickness: Everest and the third prize went to Belfast poet and dentist Paula Cunningham for A History of Snow. All winning and commended poems have been published in the 2014 Hippocrates Awards Anthology. The Hippocrates Prize is one of the most valuable poetry prizes in the world, with a yearly purse of £15,000. The Hippocrates NHS Awards were presented by barrister Robert Francis QC at an International Symposium on Poetry and Medicine at the Royal Society of Medicine in London on Saturday May 10th. Now in its 5th year, winners for the 2014 Hippocrates NHS and Open Prize for Poetry and Medicine were selected by judges poet Philip Gross, barrister Robert Francis QC and Mumsnet Editor Sarah Crown from over 1000 entries from 31 countries. The judges also agreed 20 commendations in the NHS and 21 commendations in the Open International category. Judge Sarah Crown commented: ‘We think of healthcare first and foremost as a scientific arena; a realm of dosages, diagnoses, instruments and odds. The real pleasure of these poems for me was the way in which they made the case for the place, within this arena, of the personal and the beautiful, too. Donald Singer, Hippocrates Prize co-founder and President of the Fellowship of Postgraduate Medicine, the major patron of the Hippocrates Initiative said "The FPM is delighted that in its 5th year, Hippocrates NHS Awards continue to reach out to health professionals and to the public around the world. The £5000 International Hippocrates Open first prize went to Jane Draycott from England and the £500 international Hippocrates Young Poet Prize went to Conor McKee, first year student at Sidney Sussex College, at the University of Cambridge. See links for more on results from the Hippocrates International Open and Young Poets Awards. The Hippocrates Initiative – winner of the 2011 Times Higher Education Award for Innovation and Excellence in the Arts – is an interdisciplinary venture that investigates the synergy between medicine, the arts, and health. Awards: In the NHS category there was a 1st prize of £5,000, 2nd prize £1,000, 3rd prize of £500, and 21 commendations each of £50. The 2014 Hippocrates Anthology of winning and commended poems was launched at the Awards Ceremony in London on Saturday 10th May. Dr Ellen Storm is training in Paediatrics and Child Health in Liverpool, and is the mother of three-year-old twin girls. Ellen has had poems published in magazines including Assent, The Interpreter’s House, The Reader, Frogmore Papers, Orbis and The Warwick Review. She has one forthcoming in Obsessed with Pipework, has recently contributed two to the online collaborative arts project The Egg, The Womb, The Head and The Moon (weeks 27 and 30), and will be contributing to the forthcoming Writing Motherhood project. She was commended in the 2013 Hippocrates Prize for Poetry and Medicine. Philip Gross’s The Water Table won the T.S. Eliot Prize 2009, I Spy Pinhole Eye Wales Book of The Year 2010, and Off Road to Everywhere the CLPE Award for Children’s Poetry 2011. Deep Field (2011) deals with voice and language, explored through his father’s aphasia, and a new collection, Later, was published by Bloodaxe in Autumn 2013. He has published ten novels for young people, including The Lastling, has collaborated with artists, musicians and dancers, and since 2004 has been Professor of Creative Writing at Glamorgan University. Robert Francis QC is a distinguished barrister who specialises in the NHS and medical negligence. He has been a Queen's Counsel for 21 of his 40 years at the bar. He has been involved in many inquiries into the NHS, both as barrister and as chair, most recently chairing the inquiry into the Mid Staffordshire Hospital. According to Peter Walsh, chief executive of the patient safety charity Action against Medical Accidents, Robert Francis has a "passion for justice in healthcare and improving healthcare more generally". Sarah Crown is editor of http://www.mumsnet.com/. She was editor of the guardian.co.uk/books from 2007 to 2013. Previous poetry awards for which she has been a member of the judging panels include the Forward Prizes and the Picador Poetry Prize. Hippocrates Prize Organisers Professor Donald Singer is President of the Fellowship of Postgraduate Medicine. His interests include research on discovery of new therapies, and public understanding of drugs, health and disease. He co-authors Pocket Prescriber, the 7th edition of which is published by Taylor & Francis in May 2014. Professor Michael Hulse is a poet and translator of German literature, and teaches creative writing and comparative literature at the University of Warwick. He is also editor of The Warwick Review. His latest book of poems, Half-Life (2013), was named a Book of the Year by John Kinsella. The Fellowship of Postgraduate Medicine, a national medical society founded in 1918 and publisher of the Postgraduate Medical Journal and Health Policy and Technology, has supported the Hippocrates Prize since its launch in 2009, and the Healthy Heart Charity the Cardiovascular Research Trust. 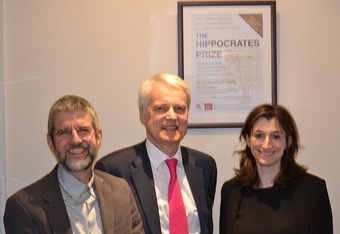 The Fellowship of Postgraduate Medicine, a national medical society founded in 1918 and publisher of the Postgraduate Medical Journal and Health Policy and Technology, has supported the Hippocrates Prize since its launch in 2009.